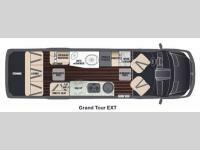 Airstream brings the best qualities of a classic Airstream travel trailer to the popular Interstate Grand Tour EXT Class B diesel motorhome. These models offer all of the amenities and comforts that you would want in a home away from home with the high quality and easy maneuverability from two unmatched, world-class companies, such as Airstream and Mercedes-Benz. The Interstate Grand Tour EXT is powered by a state-of-the-art Mercedes-Benz turbo diesel engine that delivers 18+ estimated highway MPG and provides 5,000 pounds of towing capacity. These models not only include plenty of luxurious driving features, like multiple safety air bags, collision prevention assist, lane keeping assist, and blind spot assist, but they also include a multitude of decadent interior furnishings, like the high-gloss laminate cabinetry made from Italian veneer, UltraLeather seating, a built-in work station, and a multiplex control system. 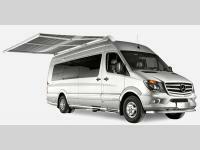 Have it all no matter where you roam with one of these Airstream Interstate Grand Tour EXT Class B diesel motorhomes!